This discussion summarizes some of the fundamental elements that go into an economic damages measurement analysis. This discussion considers that the laws related to breach of contract claims and tort claims are complex. This discussion recognizes that many of the participants to a judicial action are not attorneys. Economic damages analysts (“analysts”) are among these participants. Understanding some of the elements to a judicial action provides background information and context to the legal aspects that touch on many economic damages analyses. This in turn aids analysts in performing damages analyses and selecting the most appropriate damages measurement methods. Because measuring economic damages is sometimes related to quantifying business value, business valuation analysts are often qualified to perform economic damages analyses. This discussion summarizes the related Washington v. Kellwood Company judicial decisions. Specifically, this discussion focuses on how the insufficient and ineffective damages measurement analyses performed by the plaintiffs’ expert resulted in a multimillion dollar damages award being reduced to $1. Shareholders who dissent to a particular corporate transaction may exercise their appraisal rights and petition the court to determine the fair value of their shares. The Delaware Court of Chancery (the “Chancery Court”) continues to be the primary venue for the resolution of these statutory appraisal actions. While the Chancery Court has routinely relied on generally accepted business and security valuation methods, such as the discounted cash flow method, in the past to determine fair value, a series of recent decisions have shown a preference for using the deal price, or a value below the deal price, as the most reliable evidence of fair value. Several important decisions in the Chancery Court over the past two years will undoubtedly continue to shape how litigants view fair value. This discussion provides a chronology of several important recent decisions and explains how considerations such as transaction structure and process and expected post-merger synergies factor into the Chancery Court’s determination of fair value. In some taxing jurisdictions, the internally developed computer software of a taxpayer company may be exempt from state and local ad valorem property taxation. In these situations, the property tax assessment should not include the value of the taxpayer’s internally developed computer software. Let’s assume that the taxpayer is the type of company that is subject to property taxation based on the unit principle of property valuation. In that case, the unit value conclusion typically includes the value of all of the taxpayer’s tangible property and the value of all of the taxpayer’s intangible property. If the taxpayer is located in a jurisdiction that taxes tangible property only, then the taxing authority should adjust the total unit value for the value of any exempt intangible personal property (such as internally generated computer software). This discussion focuses on generally accepted methods that valuation analysts may use to value internally developed computer software for property tax purposes. Specifically, this discussion focuses on the application of the cost approach, and the replacement cost new less depreciation method, to value internally developed computer software. Intellectual property is intangible personal property that enjoys special legal recognition and protection, typically as a result of specific statutory authority (either federal or state). One of the four types of intellectual property, trademarks and trade names, provides explicit protections for brands, slogans, and other similar intangible personal property. As trademarks and trade names can represent a valuable type of intellectual property owned by a business, it is important for the valuation analyst to understand how to estimate an appropriate royalty rate to be used in the valuation analysis of trademarks and trade names when applying the market approach, relief from royalty method. This discussion describes tangible property, intangible property, and the various types of intellectual property. This discussion also provides guidance for the valuation analyst in estimating an appropriate royalty rate to be applied in the valuation analysis of trademark and trade name intellectual property, specifically when applying the market approach, relief from royalty method. A version of this discussion was originally published in World Trademark Review, Issue 71. Transfer price analysts (“analysts”) are often called on to estimate arm’s-length trademark royalty rates as part of a tax-related intercompany transfer price analysis. This discussion (1) summarizes the regulations for transfer pricing for federal income tax purposes and (2) describes the intangible property intercompany transfer price methods that may be used to evaluate whether or not transactions between members of controlled groups satisfy the arm’s-length standard. This discussion then provides insight regarding the factors to consider when estimating trademark royalty rates for intercompany transfer price analyses, with a focus on comparability factors for selecting market-based transactional data. The asset-based approach is one of the three generally accepted approaches that may be applied in the valuation of closely held businesses, business ownership interests, and securities. 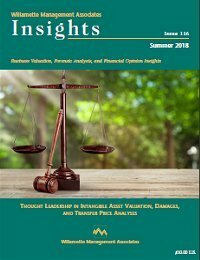 Nonetheless, many valuation analysts (“analysts”) are not familiar with the application of asset-based approach business valuation methods and procedures. And, many legal counsel— and other parties who rely on business valuations—are not familiar with how to interpret—or how to apply—the results of an asset-based approach business valuation. This discussion summarizes what analysts (and parties who rely on business valuations) need to know about the application of this generally accepted business valuation approach, particularly with regard to the issues of: the concluded premise of value, the concluded level of value, any restrictions on the sale of the subject entity assets, the recognition of an income tax liability related to any asset appreciation, and the measurement of the subject entity goodwill and any other intangible asset value.